Watching this film — narrated by Jimmy Stewart — I couldn’t help but think all those kids shown in the beginning grew up and moved to Brooklyn, where they now drive the same way. And of course, these kids today would be busily texting in their Ritalin order while driving. These kind of traffic safety programs (or driver indoctrination programs? ), whatever their good intentions, have shown to have essentially zero effectiveness, and are thus largely a thing of the past. Via the superb Prelinger Archives. Comments Off on Traffic Safety Film of the Week. Click here to leave a comment. 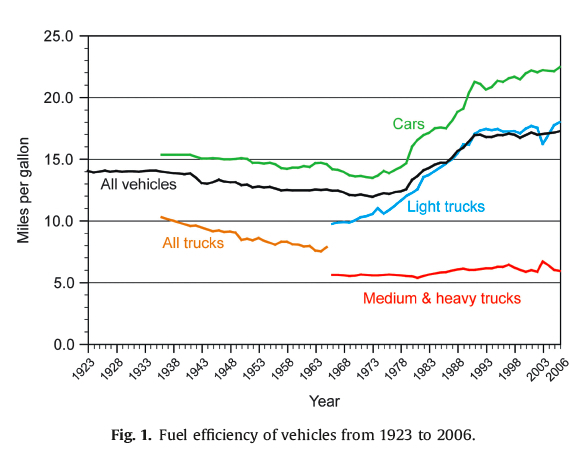 The above chart, which shows the negligible gains in fuel economy cars have seen over the last century (what efficiency gains there were have been plowed into horsepower and more weight), is from “Fuel efficiency of vehicles on US roads: 1923–2006,” by Michael Sivak and Omer Tsimhoni, published in the most recent issue of Energy Policy. After the 1973 oil embargo, vehicle manufacturers achieved major improvements in the on-road fuel economy of vehicles. However, the slope of the improvement has decreased substantially since 1991. Specifically, from 1973 to 1991, the efficiency of the total fleet of vehicles has improved by 42% (from 11.9 to 16.9 mpg). This represents a compound rate of improvement of 2.0% per year. On the other hand, from 1991 to 2006, the efficiency has improved by only 1.8% (from 16.9 to 17.2 mpg), representing a compound rate of improvement of 0.1% per year. The curve will begin to look dramatically different by the end of the second Obama administration. Comments Off on Century of Progress. Click here to leave a comment. I somehow missed this classic from The Onion. According to official police records, two officers forcibly broke into the car at 4:07 p.m. and found the iPhone lying face down on the dashboard. The iPhone at first showed no signs of life, but after a tense few seconds, officers were able to wake it and get it to respond to a series of simple touch commands. Police said that if the iPhone were left in the extreme heat for any longer, it could have died. Comments Off on Police: iPhone Left In Hot Car For Three Hours. Click here to leave a comment. 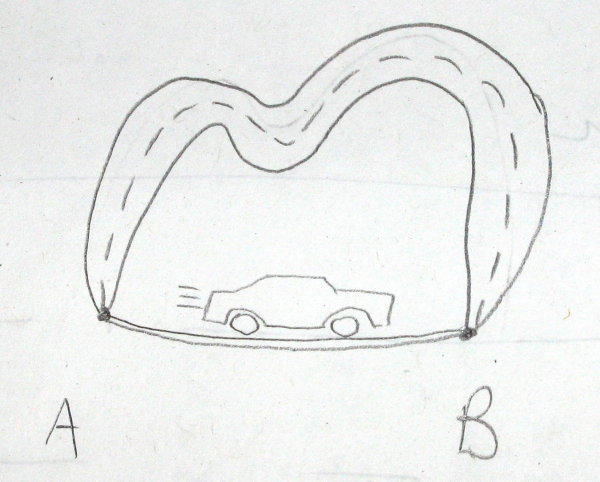 The network optimality problem known as Braess’ Paradox (often confused with the simpler notion of “induced demand”) can be tricky to explain, much less understand (and, like Bigfoot or the Yeti, everyone’s heard of it but we’re not sure anyone’s actually seen it in action, at least purely), but there’s a nice explanation (with illustrations) over at Gravity and Levity. In his good, though quite technical book Selfish Routing and the Price of Anarchy, Tim Roughgarden also uses a quite entertaining example of a spring and a weight to explain the theory. Comments Off on The Price of Anarchy. Click here to leave a comment.